The Tuesday before Lent is known as Pancake Day or Shrove Tuesday. In 2010 it was enjoyed on 16th February. It is celebrated as Carnival and Mardi Gras in many places of the world. On that day it is traditional to eat pancakes, toss pancakes and take part in pancake races. The origins of eating pancakes arose from Christians who observe Lent and wanted to use up all the rich foods in their cupboards before that period. During Lent eggs, sugar and butter were not allowed so these ingredients were used to make pancakes. A pancake is a thin, flat cake, made of butter and fried in a frying pan. It is served immediately from the frying pan. Caster sugar (superfine sugar) is sprinkled over the top and a dash of fresh lemon juice added. The pancake is then rolled. Pancakes are served with syrup, partridgeberry jam and sausages. The lucky one to find coins in their pancake will be rich, the finder of the ring will be the first married, the finder of the nail will become a carpenter and the finder of the button will be a tailor. 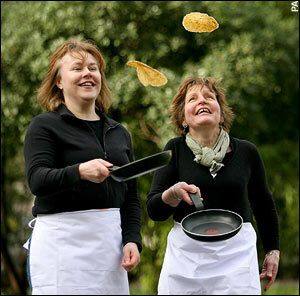 Pancake races are also very typical on this day. The object of the race is to get to the finishing line first after having run a designated path that ends up at the church whilst flipping a pancake in a frying pan a pre-decided number of times. The skill lies not so much in the running of the race but in flipping and catching the pancake, which must be intact when the finishing line is reached. Only women are allowed to participate in this race. It all began in 1445 when a woman was cooking pancakes on Shrove Tuesday to use up all of her perishables before Lent. While she was still cooking she heard the chiming of the bells summoning her to church. Not wanting to be late, the woman ran to church with her apron on and the frying pan still in her hand. Annual Pancake Grease is held at the famous Westminster School in London. A verger from Westminster Abbey leads a procession of eager boys into the playground where the school cook tosses a huge pancake over a five-meter high bar. The boys then race to grab a portion of the pancake and the one who ends up with the largest piece receives a cash bonus from the Dean. Skipping is also typical on Shrove Tuesday, where everyone assembles on the promenade to skip. Long ropes are stretched across the road and there maybe be ten or more people skipping on one rope. The person who was to become St. Patrick, the patron saint of Ireland, was born in Wales about AD 385. His given name was Maewyn, and he almost didn't get the job of bishop of Ireland because he lacked the required scholarship. The St. Patrick's Day custom started in Ireland but it came to America in 1737. 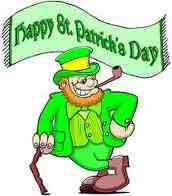 That was the first year St. Patrick's Day was publicly celebrated in this country, in Boston. St. Patrick's Day is celebrated on March 17. On St. Patrick's Day, which falls during the Christian season of Lent, Irish families attend church in the morning and celebrate in the afternoon. People dance, drink and feast—on the traditional meal of Irish bacon, cabbage, corned beef or Irish soda bread. The first St. Patrick's Day parade took place not in Ireland but in the United States, as these parades became a show of strength for Irish Americans, as well as a must-attend event for a slew of political candidates. One traditional icon of the day is the shamrock. And this stems from a more bona fide Irish tale that tells how Patrick used the three-leafed shamrock to explain the Trinity. His followers adopted the custom of wearing a shamrock on his feast day. Nowadays, St. Patrick's Day is celebrated by people of all backgrounds in the United States, Canada and Australia. Although North America is home to the largest productions, St. Patrick's Day has been celebrated in other locations far from Ireland, including Japan, Singapore and Russia. In modern-day Ireland, St. Patrick's Day has traditionally been a religious occasion. However, Iast year, close to one million people took part in Ireland's St. Patrick's Festival in Dublin, a multi-day celebration featuring parades, concerts, outdoor theater productions and fireworks shows. One reason St. Patrick's Day might have become so popular is that it takes place just a few days before the first day of spring. One might say it has become the first green of spring. Palm Sunday celebrates Jesus' triumphant entry into Jerusalem. In many churches, during Palm Sunday services, large palm branches are carried in processions. Christians remember Maundy Thursday as the day of the Last Supper, when Jesus washed the feet of his disciples and established the ceremony known as the Eucharist. The night of Maundy Thursday is the night on which Jesus was betrayed by Judas in the Garden of Gethsemane. Roman Catholic church services feature a ceremony in which the priest washes the feet of 12 people to commemorate Jesus washing the feet of his disciples. Good Friday, the Friday before Easter, commemorates the crucifixion of Jesus and is a day of mourning in church. Hot cross buns are sweet, spiced buns made with dried fruit and leavened with yeast. A cross, the symbol of Christ, is placed on top of the buns, either with pastry or a simple mixture of flour and water. The buns are traditionally eaten on Good Friday. Easter Sunday is the commemoration of the resurrection of Jesus Christ and is celebrated with great enjoyment by Christians. Churches are usually filled with flowers and the celebrations include the singing of special hymns. Easter eggs, symbolising new life, have long been associated with the Easter festival. Chocolate Easter eggs, are a favourite part of Easter in Australia. Some families and community groups organise Easter egg hunts for children in parks and recreational areas. Easter eggs are traditionally eaten on Easter Sunday. The Easter Bilby, instead of the Easter bunny, delivers eggs to Australian children. Easter Monday is the day after Easter Sunday. It is not a federal holiday in the United States of America. Some Easter traditions continue on the Easter Monday, such as the egg rolling race at the White House. Egg rolling is a popular activity on Easter Monday. Palm Sunday in the United States celebrates Jesus Christ’s entry into Jerusalem. It is also the Sunday before Easter Sunday. Many Christians in the United States remember Jesus’ triumphal entry into Jerusalem on Palm Sunday, which marks the beginning of Holy Week. Easter Sunday is an important day in the Christian church calendar because it celebrates Jesus Christ's resurrection, according to Christian belief. It is also a time for decorating eggs or sharing chocolate eggs among friends and family. Maundy Thursday, which is also known as Holy Thursday, is the day before Good Friday. It commemorates Jesus Christ’s last supper and the initiation of Holy Communion (the Eucharist), observed in many Christian churches. Good Friday commemorates Jesus Christ's crucifixion. Good Friday occurs two days before Easter Sunday in the United States. It is the day when Christians commemorate Jesus Christ's crucifixion. It is not a federal holiday in the United States, although it is a state holiday in some states. Holy Saturday is the day before Easter Sunday in the United States. Many Christians in the United States attend an Easter vigil service on Holy Saturday. They remember Holy Saturday as the day when Jesus lay in his tomb. An Easter candle is lit in some homes, particularly among families who cannot attend the Easter vigil services. Children decorate eggs with paint, crayon, water colors, stickers and other material. These eggs are often placed in Easter baskets. Maundy Thursday is the Thursday before Easter. In Britain, the Queen takes part in the Ceremony of the Royal Maundy, which dates back to Edward I. This involves the distribution of Maundy Money to deserving senior citizens (one man and one woman for each year of the sovereign's age), usually chosen for having done service to their community. On the Friday before Easter, Christians commemorate the crucifixion of Jesus Christ. It is a day of mourning in church and special Good Friday services are held. The week of Easter begins on Palm Sunday. Christians carry palm branches in parades, and make them into crosses and garlands to decorate the Church. Easter eggs are a very old tradition going to a time before Christianity. Eggs after all are a symbol of spring and new life. Nowadays people give each other Easter eggs made of chocolate, usually hollow and filled with sweets. British children hunt for (chocolate) Easter eggs hidden about the home or garden by the Easter bunny. Hot cross buns, now eaten throughout the Easter season, were first baked in England to be served on Good Friday. These small, lightly sweet yeast buns contain raisins or currants and sometimes chopped candied fruit. Before baking, a cross is slashed in the top of the bun. Easter bonnets or baskets are also made which have things like daffodils in them. 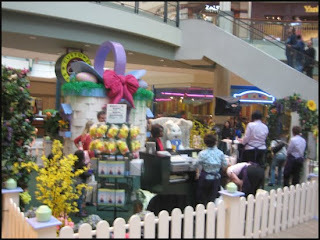 Easter bonnet competitions are held and children go to these competitions to see whose bonnet is the best. In some parts of Australia, such as Western Australia, Halloween is celebrated on Guy Fawkes Day (on the 5th November) or as it is also known Mischief Night or Danger Night. However, most Australians celebrate Halloween on October 31th. It is also known as All Hallows’ Eve and is the day before All Saints’ Day. It is a day for children to create mischief by doing tricks or getting a treat. It was not widely done in Australia as it was in America and elsewhere, in fact most children in Australia celebrated it as dance at their schools or in other activities. However, Halloween is fast becoming a popular occasion in Australia, with regular Halloween events, parades and fetes at schools, house decorations, parties, and groups of children and teenagers dressed up in Halloween costumes, trick or treating through local streets.